The Table Medal you are looking at came from a russian ruler series which covers the rulers of Russia from Rurik to Emperor Paul I, and are consecutively numbered. Made in the 19th century. In dark bronze, size 38mm. 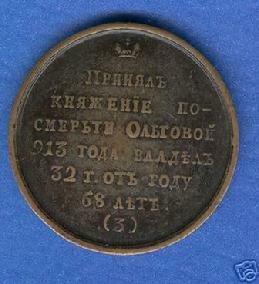 This is #3 medal of the Russian Ruler Series. 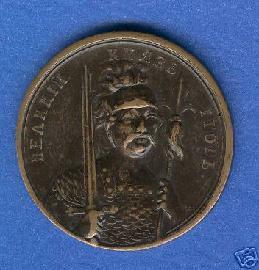 Reverse: Became Grand Duke after the Death of Oleg. Was in power 32 years and reached the age of 68.